I wanted to try this one since the ingredients did not involve buying crazy oils, spices, pastes, or wine. I also really liked the idea of my usual pasta being “healthy” with tons of veggies. The first problem I ran into was the dead zone of grocery stores that is my neighborhood. Every single red bell pepper just looked sad. I had to hunt for the last package of basil. I haven’t quite decided how to remidy this problem. I wouldn’t mind if my grocery story didn’t have such high quality if the prices weren’t that bad. 90% of the work I did was prepping all of the veggies. As you can see above, there was a plethora of chopping to be done. Mostly julienne-ing. 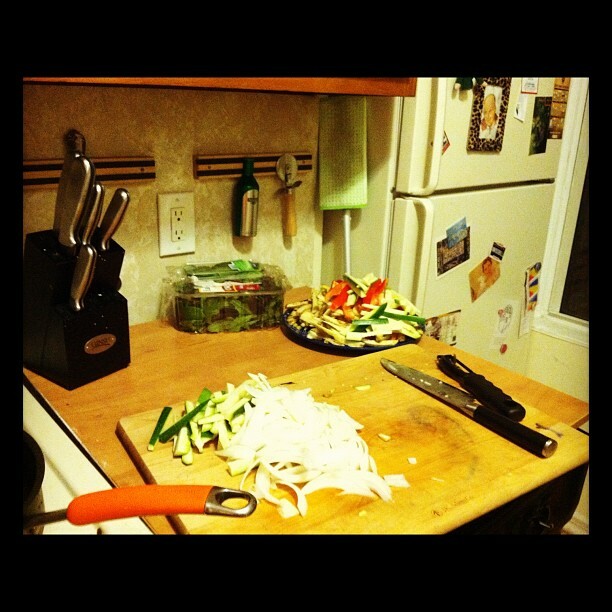 Which I learned that I am not great at doing, but I think I might have slightly improved my chopping skills. The only other part of the recipe that took a long time was getting the water to boil. On to the actual cooking, I think I might have slightly overcooked/reduced my veggies on the stove top, due to having the heat turned up too high. I am still getting used cooking with a gas stove. But the steps were basically cooking everything, then toss it all together. 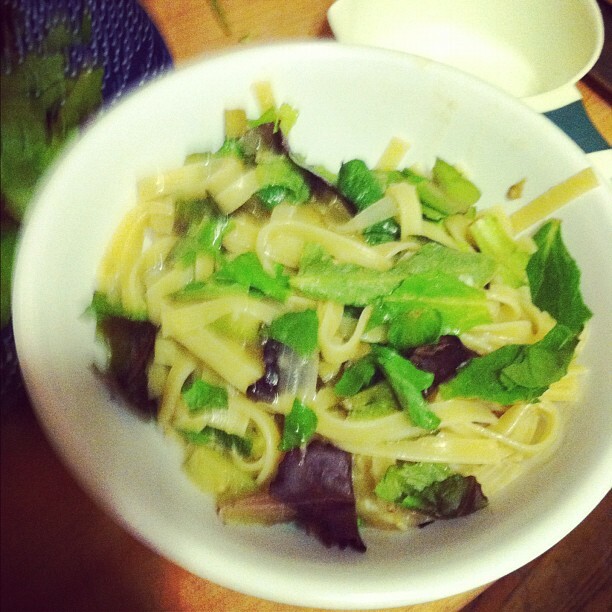 In the end, a quite simple, tasty pasta dish. For the future, I would probably wait until I could get all of these veggies in season or at least a better quality. Also, there was the pasta to vegetable ratio was slightly skewed to the pasta side. Next time, with a bigger pan, I would throw in more vegetables. It was a nice change from all the mac-n-cheese dishes I make.